Loaded represents a celebration of hip-hop culture, going all the way from the afro hairstyles made popular in the 1970s to the bling of the present. Of course, there is also a game beneath the surface, and all shall be revealed in this Loaded slot review. The first thing to explain is that there is the original Loaded slot and an HD version that comes with enhanced graphics and is capable of being played on mobile devices. A further distinction, but this time going in the other direction, is that the original Loaded slot has a higher return to player percentage (96.29% vs. 96.00%). Now that those issues have been cleared up, it is time to continue with the review. From the visuals, it’s very clear to see that Loaded has adopted a hip-hop style, ranging from the font to the collection of symbols, which are comprised of rappers, cars, boats, and jewellery. From a technical standpoint, the slot is comprised of five reels and three rows, while also providing 25 adjustable paylines. As a result, the wagering can start from only €0.01 if one payline is activated, while the maximum possible stake can be €250.00. Something to also bear in mind is that Loaded has a small range of special features that can arise from time to time. Honestly, these are amazing extras to unlock, as they can really help to build up winnings. • Wilds: Microgaming has added in wilds as a way of substituting for missing symbol positions that might occur over the 25 adjustable paylines. • Scatters: look out for the hand with bling rings and holding a microphone. 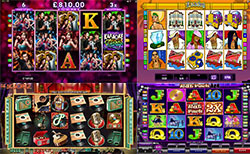 Three or more of those scatters will deliver free spins and a multiplier. • Free spins: choose from 12 spins + 4x multiplier, 16 spins + 3x, or 24 spins + 2x. Even the HD version of Loaded doesn’t look amazing, so it makes more sense to just play the original on desktop and benefit from the 96.29% RTP. Another nice perk of the game is getting to choose how many free spins and the size of the multiplier, as each option presents a very different prospect.